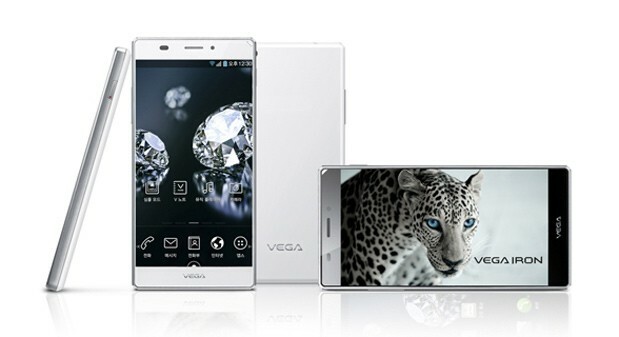 Pantech announce their new flagship: The Pantech Vega Iron! Pantech are the third tech company from South Korea which are almost always in the shadow of the considerably bigger companies LG and Samsung. That doesn't mean this David can't take some of the attention away from the two Goliaths and Pantech's latest phone, the Vega Iron, definitely grabs your attention. As you can see from the image above this is a striking phone, but we definitely think the cool images on the press pictures help! But, as you can see from the image above this is a very sleek looking device and those bezels look absolutely tiny. In fact Pantech has done a pretty good job living up to the rumours that their new phone would be "bezel-less". In actual fact those bezels aren't quite non-existent instead they are 2.4 mm in width on each side, which should make this a good challenger to the 'edge to edge' experience on Motorola's Razr I. This slim profile apparently means that the screen actually takes up 75.5% of the front of the device which is second only to Sony's Xperia ZL which has 75.8%! Other than those remarkable bezels the screen is an in-cell LCD display which is 5" in size and has a 720p resolution. Also on board is a a 1.7 GHz quad-core Qualcomm Snapdragon 600 processor, which is paired with 2 GB of RAM. According to TheDroidGuy the phone comes with 32GB of built in storage which can be expanded with cards up to 2TB! (They're not common, but they do exist.) The camera is also top of the range here too with a 13MP sensor on the back. Other then that there's Android 4.1.2 Jelly Bean on board, with an update to 4.2 in the works, as well as 4G LTE, Bluetooth 4 and the only real thing holding this back is the very small 2,150mAh battery. That is absolutely tiny for this sort of device and we can only hope that Pantech has done some serious optimising! We would have thought that customers would have preferred a bigger battery for the sake of a couple of millimeters extra on the chassis, but what do we know? What do you think? Is this something you'd like to see arrive on American or European shores? Let us know in the comments below!